These neon colored periodic table wallpapers are updated versions of the Glowing Neon Periodic Table Wallpapers to include all 118 element names and symbols. All of these periodic table wallpapers contain each element’s number, symbol, element name, and atomic mass. This dark green periodic table looks fresh from the Matrix. Make this table The One for your desktop. This bright red text looks vaguely sinister. Pink is one of the essential 80s laser colors. Go for the retro-future look with this pink periodic table. 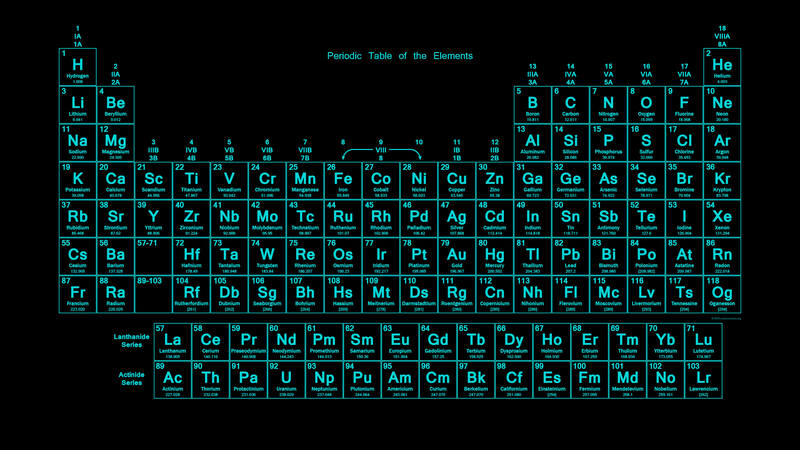 The light blue highlighter is a cool color for a periodic table. The dark blue text gives the feeling of being frozen in solid ice. Tritium green is the coolest radioactive color in the opinion of ninja turtles everywhere. Purple is the color of royalty. Give your desktop the royal treatment with this purple periodic table. Yellow text on black background conveys caution or even a warning. Don’t be afraid to download this table. A periodic table to set the gold standard of periodic table wallpapers. Each table is optimized to 4K displays with a resolution of 3840 x 2160, but they scale nicely down to smaller screens. Each image links to the full-sized neon colored periodic table wallpaper for downloading. If you prefer, right-click the links below and choose “Save link as…”.